Alps, Friuli Venezia Giulia and Eastern Veneto. Three worlds apart that with their nature, history and people engender a great cheese. Montasio. A genuine cheese, today like centuries apart. A masterpiece of experience, an authentic son of time. A time made of love, effort and passion. A unique result: a semi-hard cooked cheese with a peculiar smooth, delicate and balanced taste, without excess. Pleasant, soft flavor. A straw yellow compact flesh, with homogeneous holes, a smooth rind and delicate taste. Refined and tasty, perfect to grate. From Montasio Mezzano to Montasio Stravecchio. As time goes by the flesh becomes more and more grained and flaky, the taste more distinctive and savory, the rind more consistent and hard. 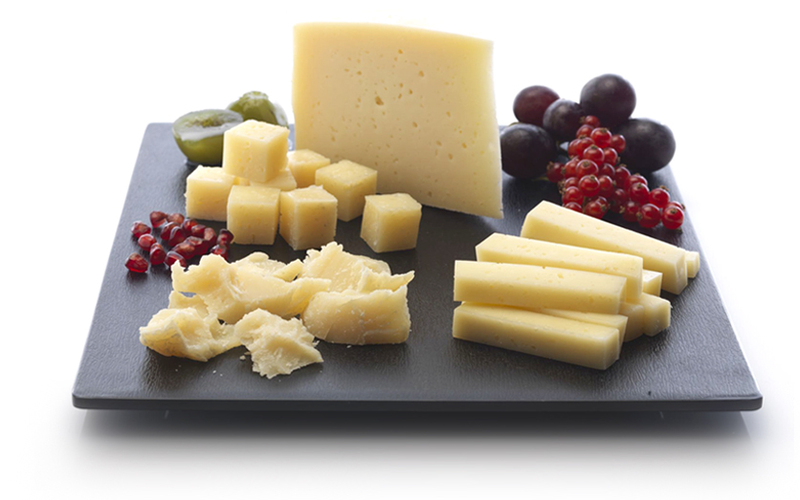 Montasio is a semi-hard cooked chees produced exclusively with cows’ milk from the designated area. The flesh of Montasio is characterized by the peculiar holes, homogeneous on the whole section with small, regular and shiny holes (eye of partridge). 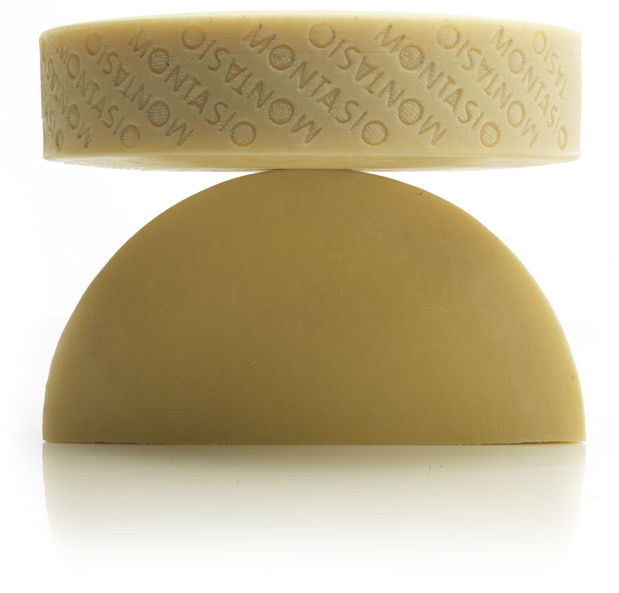 Fresh Montasio shows a smooth, elastic and compact, light-brown rind: the flesh is compact, white or straw yellow colored. As the maturation period increases, the rind becomes drier and flesh grained and flaky. 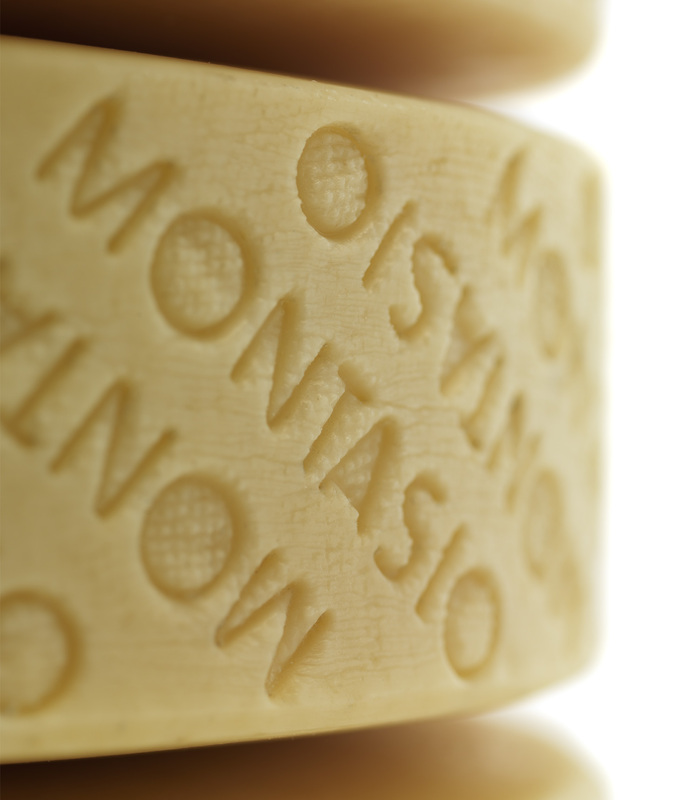 Montasio cheese identifies thanks to the mark of origin on the heel of the wheel, characterized by the repetition of the writing “Montasio” at an angle. A second mark, the quality one, is applied from the commission of the Consortium by hot branding. It identifies a product with more than 100 days, free from any maturation defects. The heel bears the production date and cheese manufacturer’s identification references. Considering the production technique of Montasio, this cheese highlights the specific features of a delicate processing, respectful of the bacterial flora and microbiological quality of milk. Therefore, tastes and peculiar features characterize a cheese with a smooth and delicate flavor, not associated with shocking or extreme olfactory or taste experiences. 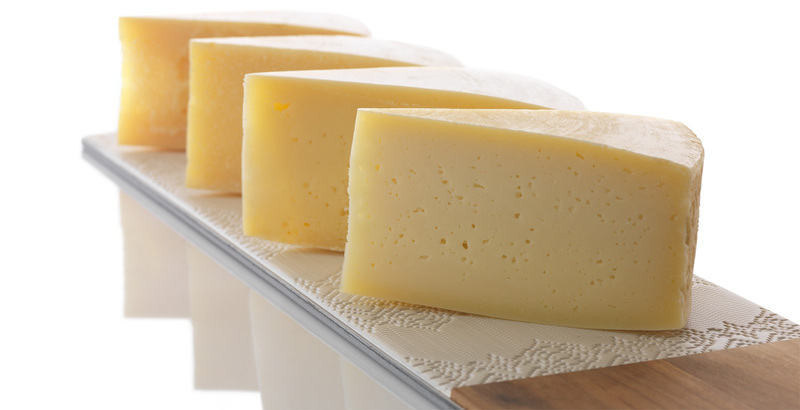 The four classic seasoning periods allow adding value to the evolving characteristics of Montasio cheese. Fresh Montasio (from 60 days of seasoning) encloses flavors of great Alpine cheeses with particular soft and delicate tastes. A detailed examination shows an elastic structure, homogeneous, regular, not excessive holes, a pleasant smell and a balanced, gentle taste. A full-bodied taste and unique organoleptic features-typical of natural products-characterize the Mezzano cheese (from 4 up to 10 months of maturing). The structure is flakier, nonetheless consistent. The color of the flesh becomes straw yellow with the formation of a tooth shape. Aroma becomes important and marked by the genuineness of the product. The cheese aged for over 10 months and Stravecchio cheese (with more than 18 months of seasoning) present unique features. The structure is flakier and holes lose their importance. The flesh becomes yellowish and rind light brown colored. Pleasantly sharp at taste, never annoying nor inappropriate to the palate. Simply perfect grated on a plate of pasta or soup full of rustic tastes. Cut into slices, it pairs well with polenta made with maize or dishes with the finest meats. 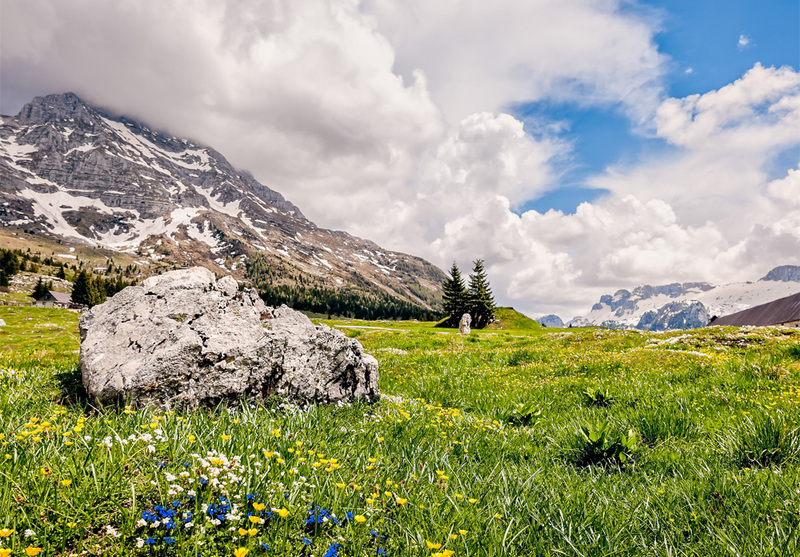 Montasio belongs to the big family of Alpine cheeses. Starting from the early beginning of the century, processing cheese was a way to store an easily perishable product-like milk-for times of the year with little or no production. 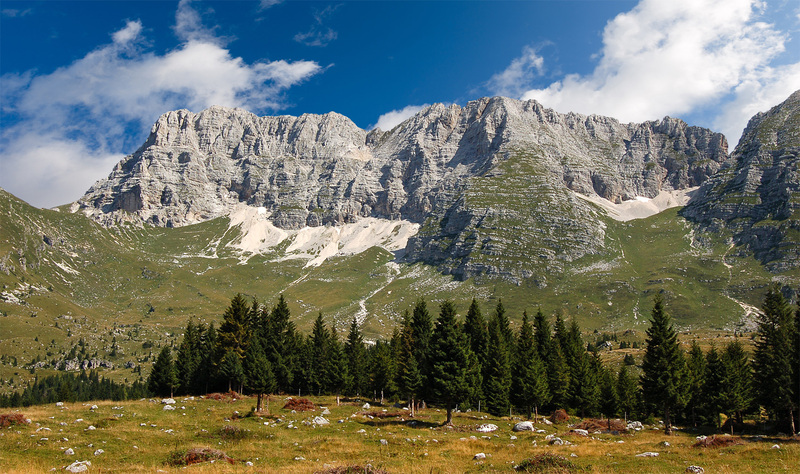 Montasio was born around year 1200 in the valleys of the Julian and Carnic Alps thanks to the persistence and intelligence of Benedictine monks. The monastery finds place in Moggio Udinese (on the north face of the Montasio mountain)-where today live the Poor Clare Sisters-, there probably were honed the production techniques of the cheese makers of the area. Soon, this production technology spread out in the valleys of Carnia and Friulian and Venetian plain. The first documents reporting the labeling “Montasio cheese” are the price lists of the city San Daniele, which date back to 1773 and set a selling price for the Montasio much higher with respect to other cheeses. From that moment on, Montasio is present in all Merchant documents of the north-east of Italy. Since then, the production technique has developed further; however, the concept of processing remained intact from the origins. In fact, milk is processed into cheese by means of soft techniques, which maintain intact the original bacterial and microbial flora. 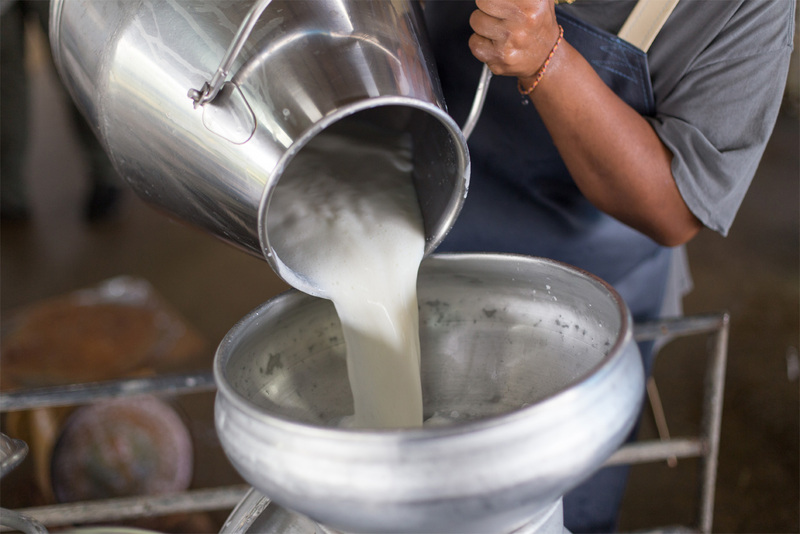 Essential ingredient for the production is raw, fresh milk that did not undergo energetic treatments. In order to drive fermentation, they use a low-acid graft obtained by fermenting milk after a pasteurization involving low heat treatments. Thus, natural milk ferments-peculiar of the production area, bovine breeds and type of hay products-multiply. The classic processing technique foresees the separate collection of two milkings, with subsequent skimming of milk in the evening. The milk collected is places in boilers-usually in copper-where they add a starter culture to the extent of 0.5/1 Kg per hectoliter reaching a temperature of 32/34 °C and then adding rennet derived from dried stomachs of colostrum-deprived calves. After about 20/25 minutes of coagulation, the gelatinous mass is cut by means of a relevant instrument, the lyre (named after the musical instrument dear to Nero). Grains obtained have the size of rice. Now the heating process begins and the temperature of the mass reaches 44/46 °C. 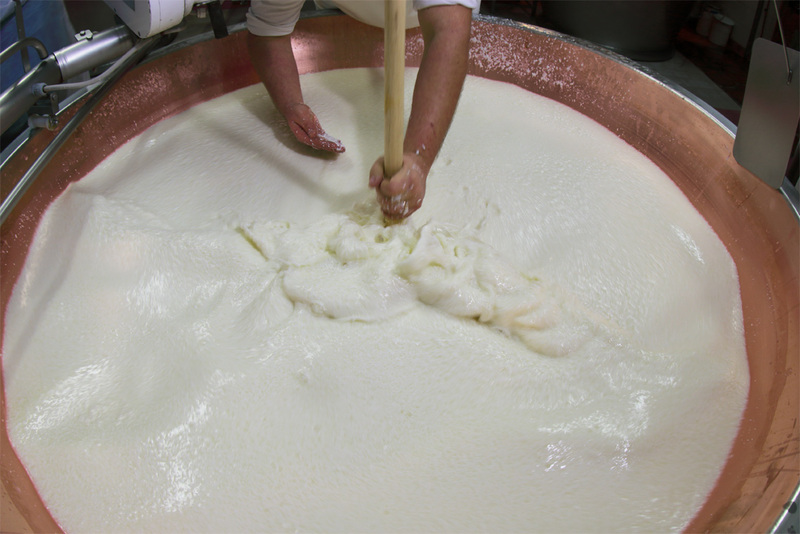 Cooking and dripping of the curds take place while continuously stirring: an essential step aimed to firm the mass by expulsion of serum from the grain of curd. In about 20/30 minutes, they proceed to extraction of the Montasio wheels, by means of canvas. Cheeses are laid down in the peculiar “molds” that reproduce the original mark of origin, date of production and dairy. At a later stage, cheeses are pressed to drain serum and confer the characteristic shape to the wheel. After about 24 hours, the cheese is soaked in brine (saturated salt solution) for 48 hours. Then, after a dry curing process, the cheese is stored for seasoning. the whole territory of the provinces of Treviso, Belluno and-in part-the provinces of Venice and Padua.